There are many different techniques you can use to train your dog, and it is important to find one that works for you and your family in order to have the most loyal and well-behaved pet possible. All successful styles of dog training emphasize the bond between dog and owner, and the basis of a successful training program is earning the dog’s respect. It is fortunate that dogs are innately programmed to submit to a leader, it allows them to follow commands and make training easier. This article will discuss one of the more common types of dog training –leash/collar training. It will also examine and review the best training leash for your dog we found so far. Both the leash/collar styles of dog training and reward-based dog training have been proven to be effective methods over time. The method of training that is most effective is dependent on the dog’s breed and his temperament. Each dog has its own personality, which is emphasized even further by many years of selective breeding. The personalities of individual dogs can be very different, even within the same breed. It is up to you, as the owner, to determine which method of training will work best for your dog, so it is important to work with the trainer in order to attain your goal of an eager, well-trained and friendly dog. Leash/collar training is the best way to fulfill many factions of dog training, especially in circumstances where the dog must be very dependable. For example, certain working dogs, such as police dogs, rescue dogs or guard dogs, tend to gain from leash and collar dog training. In that kind of dog training different levels of force can be used, varying from light modifications with the lead to firmer corrections. The level of correction used should be relative to the situation, as too much correction, or not enough, can prove unproductive. In a leash/collar emphasized dog-training program, the dog is first taught a desired behavior on the leash. Once the dog seems to understand the command, the leash is then used to modify incorrect behaviors. The leash is used as the main form of control and communication with the dog in this form of training. With collar or leash dog training, the dog must learn to trust the handler and follow commands without any hesitation. The dog is considered fully trained when the handler is able to show that the dog will follow a command even if he does not want to. While this does not mean using brute force, it will likely necessitate some physical handling. This type of handling is most effectively completed by use of the leash. Anyone attempting to train his or her dog should understand that the leash is merely a device. While the leash is necessary for this style of dog training, it is important for the dog trainer to strive for the same results using whatever gear are nearby. 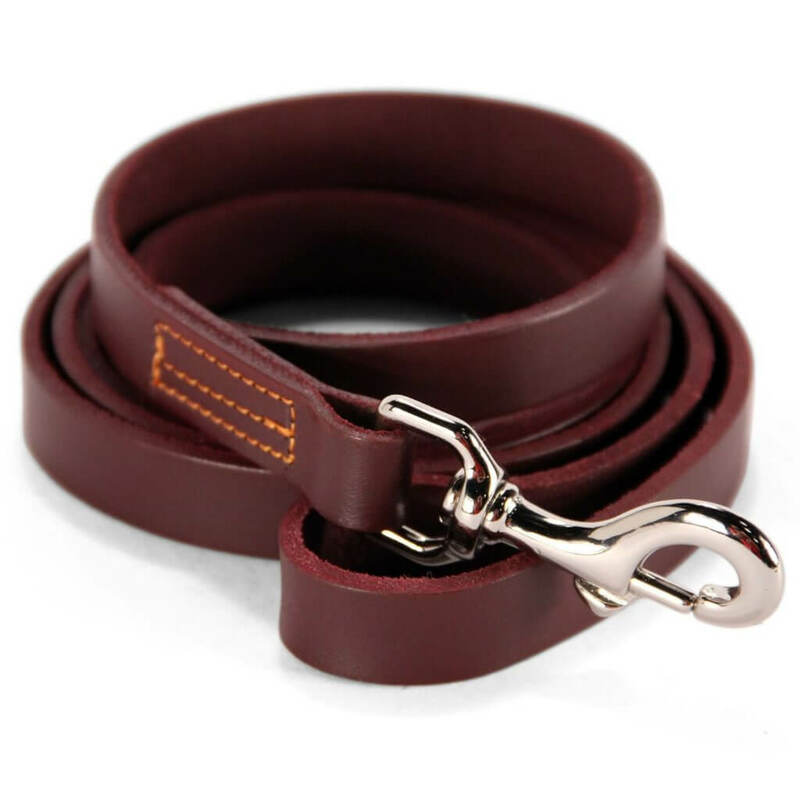 GENUINE FULL GRAIN LEATHER LEASH for a lifetime of heavy duty use. 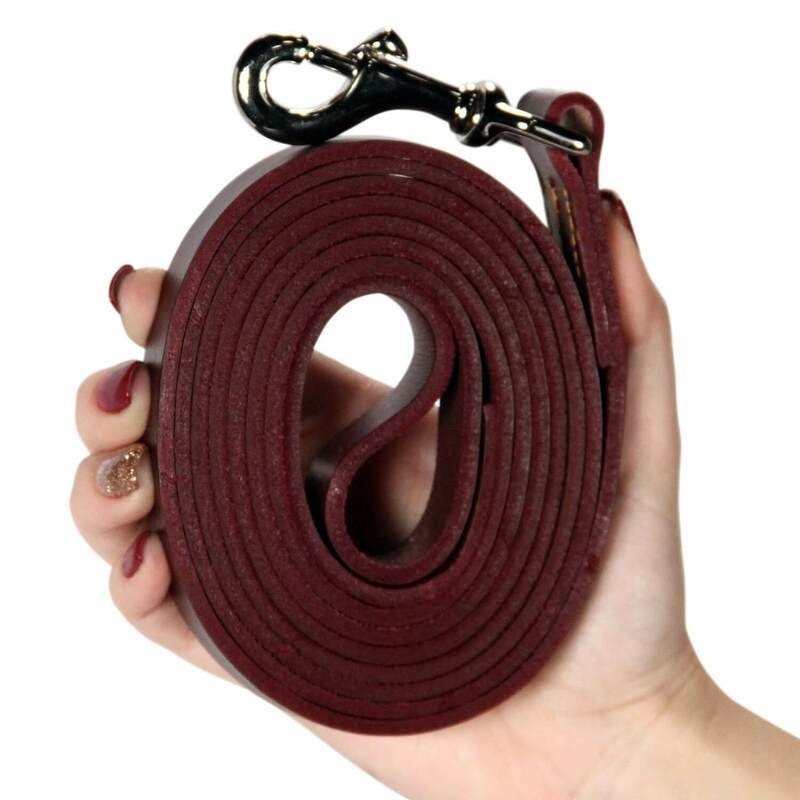 Made from a single long piece of thick premium grade leather to last even through extreme conditions – Six feet long, 5/8 inch wide and 1/8 in. thick. PROFESSIONAL GRADE – Police and Military gauge training weight handles even the strongest working dogs. 6 foot length recommended by trainers worldwide. BEAUTIFUL, STRONG AND DURABLE – Resists water & stains with minimal care, yet feels supple and won’t tear at your hands or collect hair like nylon leashes when training, walking or running with your pet. PREMIUM NICKEL PLATED SOLID BRASS CLASP clips on and off the collar easily yet won’t disengage without release by the trainer. BEST LIFETIME GUARANTEE – If, For Whatever Reason, You Don’t Absolutely Love Your Leather Training Leash, Just Return It, And We’ll Refund Every Penny (Or Replace It, If There Is A Problem). What separates Logical Leather Training Leash for Dogs from the competition? These leashes are hand-crafted in North America. These leashes are sturdy, durable and soft, made from genuine Full Grain leather and are beautifully finished. This 6 foot leash is the standard recommended by professional dog trainers around the world. It is strong enough to handle very large dogs, but light enough that even smaller dogs will be comfortable with the weight. The high quality finished leather is water resistant, cleans easily and won’t tear at your hands like cheap nylon leads. When it comes to the buyer reviews on Amazon this leash scores a respectable average score of 4.2 out of 5.0, based on over 600 customer reviews at the time of writing.The seller also offer you immediate refund for your entire purchase just in case you don’t like the leash for any reason! No matter what device the owner uses for training, such as the owner’s body and voice, the dog should be eager to comply. Building a trusting relationship between owner and dog is vital, and it is important that the leash is used as a tool rather than a crutch. A properly trained dog should be eager to obey with or without a leash.